Menulog delivers for PappaRich - Adelaide CBD so you'll be able to track your courier on a map. A fluffy and slightly crispy hand tossed bread served with curry sauce, sambal and dhal for dipping. Roti Canai with a serve of curry chicken. The dish also comes with dhal and sambal for dipping. Roti Canai served with our homemade Tandoori Chicken - an Indian style roasted chicken. The dish comes with raita, sambal and a wedge of lime. Roti Canai with egg throughout the bread. The dish is served with dhal and sambal. Roti Telur served with curry chicken, dhal and sambal. Roti Canai with margarine and a dash of sugar throughout the bread. The dish is served with curry sauce, dhal and sambal. Yet another variant of the ever popular Roti Canai but this time with kaya (coconut jam) throughout the bread. Roti Canai with our lovely combination of egg and onions throughout the bread. The dish is served with dhal and sambal. Served with dhal and sambal. Roti Canai with a serve of beef rendang. The dish also comes with dhal and sambal for dipping. Roti Telur served with beef rendang, dhal and sambal. Roti Canai with a serve of Vegetarian Curry Mutton, dhal and sambal for dipping. 1 slice of toasted Hainan bread with butter and our homemade kaya on the side. 1 slice of toasted Hainan bread spread with butter and condensed milk drizzled on top. 1 slice of toasted Hainan bread with peanut butter spread on top. 2 slices of toasted Hainan toasted bread with butter and sugar on top. Toasted Hainan sandwich with butter and our homemade kaya inside. A Malaysian favourite that comes complete with tender boiled chicken, fragrant chicken rice, chicken soup, bean sprouts and a combination of chilli, ginger and dark soya sauce for dipping. Fried rice served with fried chicken, fried egg, pappadum, sambal and cucumber slices. Fried rice served with prawn and chicken slices. With curry chicken and sambal prawns. Also comes with fried anchovies, fried peanuts, hard boiled egg, cucumber slices and daily made spicy sambal. Also comes with fried anchovies, fried peanuts, hard boiled egg, cucumber and daily made spicy sambal. Salted fish fried rice served with chicken slices and egg. Deep fried chicken coated with black pepper sauce, served with chicken rice, fried egg, sliced cucumber and mixed vegetables. Deep fried chicken coated with curry sauce, served with chicken rice, fried egg, sliced cucumbers and mixed vegetables. Hokkien noodles in spicy coconut curry soup with chicken slices, tofu puffs, foo chok (beancurd skin), bean sprouts, eggplants and fishcake. Hokkien noodles in spicy coconut curry soup with tofu puffs, foo chok (beancurd skin), eggplants, tomotoes and bean sprouts. This is not a vegetarian dish. Hokkien noodles in spicy coconut soup with mussels, prawns, eggplants, tofu puffs, foo chok (beancurd skin), fish cake and bean sprouts. Wok fried flat noodles with prawns, fish cakes, egg, bean sprouts and chives. This dish is mildly spicy. Wok fried Hokkien noodles with prawns, tomatoes, potatoes, egg and bean sprouts. This dish is mildly spicy. Hokkien noodles served in our special Pappa prawn broth, served with fresh prawns, hard boiled egg, chicken slices, bean sprouts and water spinach. Thin flat rice noodles in our freshly boiled chicken and prawn head broth. Topped with chives, red chilli, bean sprouts and a serve of steamed chicken. Thin flat rice noodles served with tasty sweet sauce, red chilli and a serve of steamed chicken. Egg noodles topped with choy sum, red chilli and fried shallots, doused in rich curry gravy, served with steamed chicken. With prawns and chicken slices. Thin flat rice noodles in our freshly boiled chicken and prawn head broth. Topped with prawns, chicken slices, chives, red chilli and bean sprouts. Wok fried combination thick flat rice noodles with egg gravy, prawns, fish cakes, chicken slices, choy sum and fried shallots. Wok fried egg noodles with egg gravy, prawns, fish cakes, chicken slices and choy sum. Egg noodles doused in rich curry gravy and served with curry chicken, choy sum and red chilli. Wok fried rice starch noodles with chicken slices, prawns, egg, bean sprouts, chives and red chilli This dish is spicy. Thin flat rice noodles doused in rich curry gravy and served with steamed chicken and fried beancurd skin. 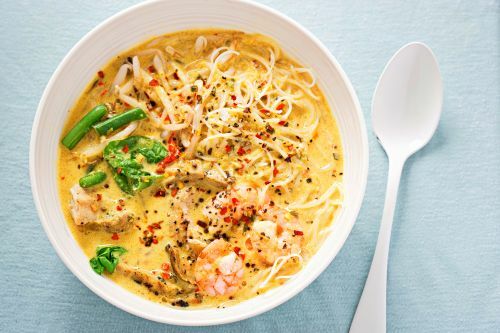 Thin vermicelli noodles in creamy, balanced double boiled soup. Topped with fried fish head, silken tofu, tomatoes, preserved mustard and choy sum. Thin vermicelli noodles in creamy, balanced double boiled soup with fried fish fillet, silken tofu, tomatoes, preserved mustard and choy sum. Spicy, creamy coconut curry soup with fried fish head, tomatoes, eggplants, tofu puffs and bean sprouts. Thin vermicelli noodles in spicy, creamy coconut curry soup with fried fish fillets, tomatoes, eggplants, tofu puffs and bean sprouts. Grilled chicken marinated in fresh lemongrass and turmeric served with peanut sauce and bite sized cucumbers and onions. Consists of prawns, soybean, sesame, egg, starch and bamboo shoot. Consists of chicken, cabbage, carrot and egg. Chinese broccoli stir fried with oyster sauce and topped with fried shallots, tastiest when eaten pipping hot over steamed rice. (Rice to be ordered separately). Stir fried fresh bean sprout with salted fish, chives in light soy sauce, tastiest when eaten pipping hot over steamed rice. (Rice to be ordered separately). Delicious water spinach stir fried with fragrant dried shrimp paste, tastiest when eaten pipping hot over steamed rice. (Rice to be ordered separately). Chicken wings deep fried to a golden hue and served with chilli sauce. Crispy crunchy marinated chicken skin is the must try sinfully delicious bites in PappaRich. An Indian style roasted chicken served with raita, a wedge of lime and sliced red onion. Nasi Lemak served with Vegetarian Curry Mutton, fried peanuts, hard boiled egg, cucumber slices and our delicious daily made spicy sambal. There is no egg in this dish. Fried thin vermicelli noodles served with Vegetarian Curry Mutton, beancurd skin, sliced cucumber, tofu, lettuce and egg. Our vegetarian version of Char Koay Teow comes with wok fried flat noodles with sliced tofu, egg, bean sprouts and choy sum. A vegetarian version of the original Char Koay Teow from the Noodles section. There is no egg in this dish. Coconut milk and gula melaka poured over sago pudding and topped with red bean and mint leaves. Caramel pudding dressed in sago, coconut milk, gula melaka and topped with mint leaves. Blended ribena topped with watermelon balls, coconut jelly and lychee. Blended mango topped with watermelon balls, coconut jelly and lychee. Blended coconut juice topped with coconut meat and mint leaf.